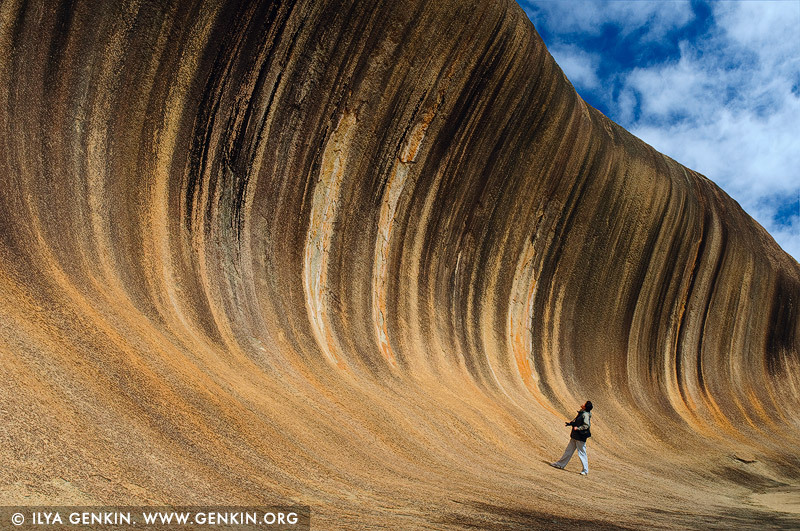 Wave Rock is one of the many amazing rock formations found in Western Australia. It is situated near the small town of Hyden, about 350km east of Perth. Wave Rock stands 15m high, 100m long and looks like a tall wave just about to break. This unusual shape has been greatly highlighted by vertical streaks of algae which grow on the surface of the 'wave' as dark black stains which change to brown during the dry season. The shape of the wave is formed by gradual erosion of the softer rock beneath the upper edge, over many centuries. Also, in the Wave Rock Area are other unusual rocky outcrops such as Hippos Yawn, The Humps, Camel Peaks, King Rocks. These are the largest and most well known and are but a few of hundreds that are scattered around this central wheat belt area. This photo is actually the perfect example of why you need to shoot people in landscape photos sometimes – just to get depth and scale. This image belongs to the travel and nature stock photo library. This stock photo of Wave Rock is available for licensing for commercial and editorial uses including websites, blogs, books, magazines, brochures and advertising. Restrictions may apply for images which contain third party copyrighted material or sensitive subjects. Photos of artwork are for editorial use only. This image id WA-WAVE-ROCK-0001 of Wave Rock, is copyrighted © by Ilya Genkin. This is not a public domain image.